Samsung just upped Apple on smartphones. The Samsung Galaxy S7 and S7 Edge is another giant step forward in performance and feature specifications. Weatherproof casing, 12MP camera, 4GB or RAM and finally a battery life that may actually last a full day. To no surprise, the size of the new Samsung Galaxy S7 is a little different from prior generations. With a 5.1 inch diagonal screen this phone is 5.61 inches tall by 2.74 inches wide by .31 inches deep. The Samsung Galaxy S7 Edge is a lot different. Moving up to a 5.5 inch diagonal screen, the S7 Edge is 5.94 tall x 2.86 wide x 0.30 in. These are important measurements to keep in mind when selecting your mount. For those with any custom mount which features a cradle specifically made for a previous generation, they aren’t going to fit and you will need to purchase a new mount, or at least a new cradle. For those that have purchased a universal mount to hold your older phone, hopefully it opens wide enough to hold your new device without a problem. Most universal mounts offer options to upgrade your cradle to a larger one. These are expensive phones. Among the most expensive in fact. Buy a case for it. 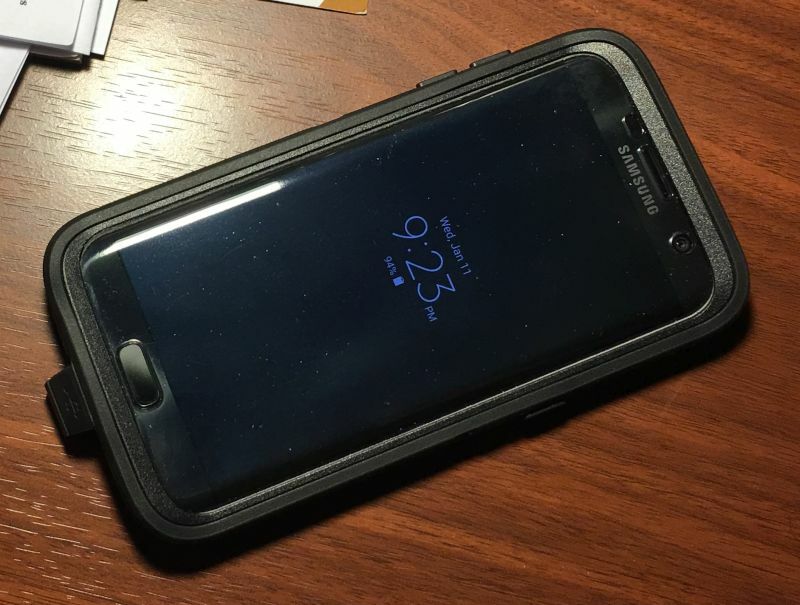 I have always liked the Otterbox Defender series which we reviewed here, and the OtterBox Defender Case for Samsung Galaxy S7 is going to work real well. There are other brands that also make great cases such as Spigen. A single drop on ceramic tile that results in a broken lens will cost way more than the case. If you think insurance will cover you, think again. Insurance policies purchased from your carrier have a deductible and for newer more expensive phones that can be $169 on up. So to add insult to injury, you will not only be paying the monthly insurance premium, but you will then pay the deductible. You can read an article on this unnecessary product here. Bottom line – buy a case. On to the mount discussion. Readers of our site know that we favor well made mounts with expandable cradles to fit protective cases. With expandable cradles, you also have the opportunity to reuse your mount when you upgrade your phone. All of the mounts we recommend should fit both the Samsung Galaxy S7 or S7 Edge with or without a case or skin. In any case, measure your phone with the case to get an exact idea of how wide a cradle will be needed. For the car, give the location of your mount some thought. There are lots of places to mount your Samsung Galaxy S7 or Samsung Galaxy S7 Edge. The windshield is always the most popular location to mount especially if you plan to use it as a GPS with my favorite application which is Waze. Consider the Arkon’s Megagrip Travel Mount. This mount features an expandable cradle which expands to 3.4 inches by pressing the button at the lower left corner of the cradle. This will fit your phone with or without a thick case. The mount comes with an adhesive dash plate so that you can attach to the mount to your dash as well as your windshield. Lots of cup holders in today’s vehicles, so use one as a mount point. Consider the iKross Car Cup Holder Phone Mount. The cup holder base is expandable from 2.7 to 3.7 inches. It will fit almost any vehicle’s cup holder. There is a 12″ flexible stem that allows bending of the mount to the right angle for the driver or passenger. The phone can rotate 360 degrees into portrait or landscape and is easy to insert and remove. The expandable cradle opens to 8 inches so it will fit your phone with or without a case or skin. This mount comes with a one-year warranty. Another interesting location for your phone is the car air vent. The Spigen Magnetic Car Mount Holder for SmartPhones is an excellent choice for the vent. This mount features grippers that can be used on horizontal and vertical vents. Right around eye level and out of the way of potential thieves, the vent is a good location for mounting a lightweight device. Check your vent to make sure it’s well made enough to hang a lightweight device. A recent innovation is mounts is the use of a small magnet coupled with a very think adhesive metal disk which sticks to the back of your phone. The great thing about magnetic mounts is the simple process for install and removal. It’s a simple matter of simply matching up where the metal strip is to the magnet. For motorcycle use, it’s important that you select a mount that has a well constructed cradle that is going to hold your Samsung Galaxy S7 or Samsung Galaxy S7 Edge very tightly so that it stays put through the vibration of a ride. We continue to recommend the RAM X-Grip line. These are heavy-duty mounts that are mostly constructed of metal and feature a lifetime warranty. The mount has gone through some rigorous shake tests and holds up well on a motorcycle. We wrote about X-Grips extensively on this site and you can view that article here. Most motorcycles can use the RAM X-Grip IV Handlebar Mount. These mounts feature the expandable X-Grip IV cradle which can open to 4.5 inches which is large enough for almost all cases. We always recommend tethering your device for added security. RAM recently added a tether to these cradles, so be sure to buy one from recent stock or add a tether.